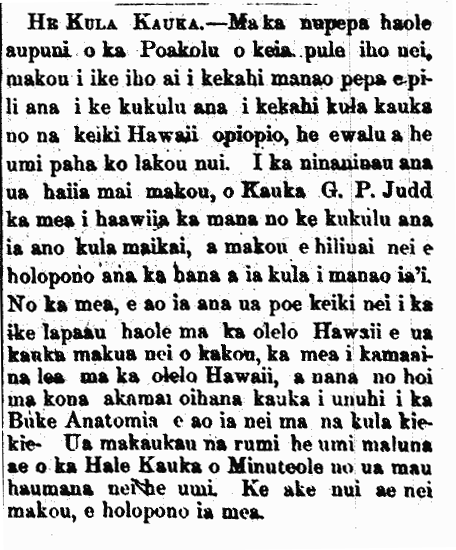 Dr. G. P. Judd starts a medical school for Hawaiians, 1870. Medical School.—In the English government newspaper [Hawaiian Gazette], we saw an editorial [manao pepa] pertaining to the establishing of a medical school for Hawaiian youths, perhaps eight or ten in number. After asking about, we were told that it is Dr. G. P. Judd who suggested the idea of starting that type of fine school of which we have faith that this proposed school will go well. Because these youths will be taught the haole medicine in the Hawaiian language by that elder doctor of ours, the one that is fluent in Hawaiian, and it is he in his knowledge of medicine who translated the Anatomy Book which is being taught in the high schools. Ten room are set up above the Residence of Dr. Stangenwald [Minuteole] for those ten students. We dearly hope that it goes well. Ka Manawa, Buke I, Helu 3, Aoao 2. Novemaba 21, 1870.